NASA astronaut Steve Swanson kicks a small soccer ball on the International Space Station in honor of the start of the 2014 World Cup tournament. Image released June 11, 2014. 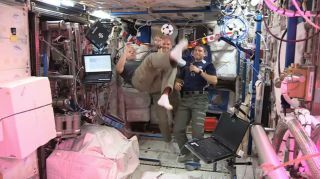 Three astronauts in orbit are getting into the World Cup spirit on the International Space Station. The crewmembers are joining with billions of soccer fans back on Earth to root for their favorite teams in the 2014 FIFA World Cup tournament, which starts today (June 12) in Brazil. NASA astronauts Reid Wiseman and Steve Swanson created a World Cup tribute video from space with European Space Agency astronaut Alexander Gerst of Germany to send their well wishes to people on Earth as the tournament kicks off. "We want to wish all the teams and fans on the ground and in Brazil a great World Cup," Gerst said during the video. "Have fun and have peaceful games. May the best win." The two NASA astronauts and Gerst will get a chance for a little friendly competition when Germany and the United States face off on June 26. The astronauts also plan to watch as many games as possible, according to NASA spokesman Kelly Humphries. "Have fun," Wiseman said during the video. "Play hard, and we'll be watching on the International Space Station." Space station crewmembers have celebrated the World Cup from space before. During the last tournament in 2010, NASA astronaut Tracy Caldwell Dyson and her fellow residents cheered on the teams from space. One Russian cosmonaut, Alexander Skvortsov — a soccer fan according to his NASA biography — was living on the space laboratory during the 2010 World Cup with Caldwell-Dyson, and he is up in space again for this year's matches. Skvortsov, Wiseman, Gerst and Swanson are joined on the station by Russian cosmonauts Oleg Artemyev and Maxim Suraev, rounding out the station's Expedition 40 crew. The $100 billion orbiting outpost has been continuously occupied by rotating international crews since 2000. Five different space agencies representing 15 countries helped build the station, and construction started in 1998 when the first piece of the space lab was launched to orbit.